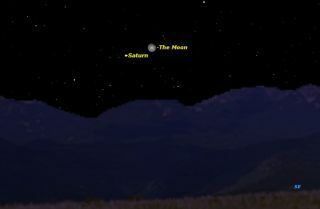 Saturn and the gibbous Moon rise together in the eastern sky this evening around 10:30 p.m. If your weather is clear, look toward the eastern sky tonight (April 16) about 10:30 p.m. your local time. You should see the bright moon rising, and just below and to its left will be a bright star-like object. But that's no star, it's the planet Saturn, and it is already a presence in the late evening sky, weeks ahead of May 10, when it reaches opposition to the sun. It takes a telescope magnifying at least 25 times to see Saturn's famous rings. Even then, they will just make Saturn appear oval rather than round. A telescope magnifying a 100 times will show a tiny perfect planet with rings. A larger telescope still will resolve the details within the rings, such as the Cassini Division which separates inner and outer rings, and the details of the shadow of the planet on the rings, and the shadow of the rings on the planet. Saturn's system of moons is perhaps the most fascinating in the whole solar system. Unlike Jupiter's four bright moons, whose orbits are seen edge-on from Earth, Saturn’s moons revolve in a plane tilted at the same able as its rings, so that the moons describe ovals around the planet, as shown in the second image. Saturn's brightest moon Titan is visible in just about any telescope, but you will need a planetarium program like Starry Night to separate it from the background stars. The next brightest moon Rhea is visible in most amateur telescopes. The fainter pair, Dione and Tethys, are more of a challenge. The innermost moons, Mimas and Enceladus, are hard to spot because they are small and close to the outer edge of the bright rings. Iapetus is perhaps the most interesting of Saturn's moons. Unlike the inner five, its orbit is tilted at an angle to Saturn’s rings, so Iapetus' position is quite hard to predict without a good software program. Seen through a telescope, Saturn is surrounded by a swarm of moons. Most orbit in the same plane as Saturn’s rings, but Iapetus has a larger orbit tilted at an angle. Iapetus also varies quite a bit in brightness. Like all large moons in the solar system, it is tidally locked to its planet so that it always keeps one face inward. As it moves around Saturnits leading face has been impacted by countless small moonlets, so that it looks like it's been painted with tar. When that tarry face is towards us, Iapetus is almost two magnitudes fainter than when it's trailing face is towards us. If you follow Iapetus around its orbit, which takes 79 days, you will see it fade from its brightest (at present) of 10.1 magnitude down to its faintest of 11.9 magnitude. That will occur in the last week of May. It will return to full brightness in the first week in July. All of Saturn's moons are so far distant from us that they appear only as points of light, except in the largest telescopes. But watching their changing positions from night to night is endlessly fascinating. Editor's note: If you snap an amazing photo of Saturn that you'd like to share for a possible story or image gallery, please contact managing editor Tariq Malik at spacephotos@space.com. This article was provided to SPACE.com bySimulation Curriculum, the leader in space science curriculum solutions and the makers of Starry Night and SkySafari. Follow Starry Night on Twitter @StarryNightEdu. Follow us @Spacedotcom, Facebook and Google+. Original article on Space.com.